Well, I’m doing two of those (advil & losing weight) now. I don’t want to do PT, but will work on my quads at the gym with a trainer. I don’t feel a need for a brace right now, but if it comes to that, I’m open to it. He gave me a cortisone shot to my knee (oooh what a long needle) which didn’t hurt at all. Ahhhh, the pleasures of growing old Of course, the doc told me people usually get this in their 60s or 70s, but you know me, I have to be different! My knees hurt too. Gah. Just two more reminders that it’s time to hit the gym and cut out the sugar. Gah. Also? GAH! The full moon has bothered me for the past few months. I miss my sleep! Try some Osteo-BiFlex or generic glucosamine and chondrontin. It’s supposed to help cushion the joints. Don’t know if it will help, but it certainly can’t hurt! Congrats on your cancer free news. So cool. I’m thinking I might need to start counting some points again soon. I’ve got a long history of arthritis in my family, but so far I’m hanging in there with just a bit after yard work and if I get too carried away with needlework and/or crochet… I have gotten achy knees in the past, from running. (So I avoid that by not running, ha!) Hope your knees improve! Oh, golly. 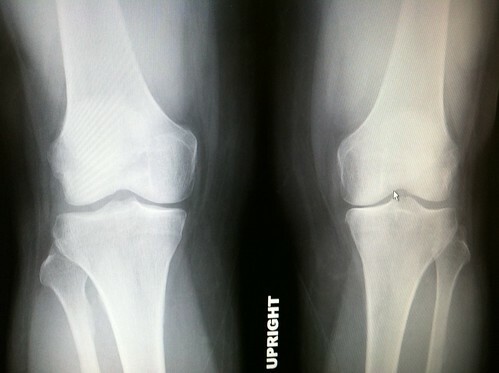 with everything else, I have arthritis in my knees too – mostly from an injury when I was young and foolish. Advil is good. I haven’t done PT precisely, but when I had the luxury of a fitness trainer, he helped me strengthen some of the surrounding muscles, which really helped. I occasionally used a brace when I knew I was going to do something strenuous. It’s true weight loss makes a big difference, too, and you seem to be doing great.